Travel to Bhutan, the land of the peaceful thunder dragon, known to the world by several names such as the `the Last Shangri-La` or `the Last Place on the Roof of the World.` Though the original name from the time of Marco Polo was `Bootan`, the natives prefer to call their country `Druk Yul`, or the Land of the Peaceful Thunder Dragon. Nestled in the lap of the Himalayas, Bhutan offers spectacular mountain views, immense scenic beauty and a unique culture and lifestyle. You can see beautiful Buddhist monasteries, carved wooden houses and the fine crafts of Bhutan, on tours to Bhutan with tourism in Bhutan. Day 01: Fly from Delhi to Bagdogra & transfer by car to Phuntsholing. Day 03: Drive to Wangduephodrang. Time at leisure & local discovery. Day 04: Drive to Punakha, the old capital of Bhutan. On return see Chimi Lhakhang monastery. Day 05: Drive to Trongsa, afternoon visit Trongsa Dzong. Day 06: Drive to Bhumthang, enroute visit Chume weaving centre, later explore Bhumtang. Day 07: Drive to Wangduephodrang & at leisure. Day 08: Drive to Thimpu, visiting the Tashichho dzong. Day 09: Drive to Paro, local discovery and time at leisure. Day 10: Full day tour, soft treks can be organised here. Day 11: Fly back to Delhi & connect Intl flight to UK / Europe. Bhutan, the land of the peaceful thunder dragon is known to the world by several names such as the `the Last Shangri-La` or `the Last Place on the Roof of the World.` Though the original name from the time of Marco Polo was `Bootan`, the natives prefer to call their country `Druk Yul`, or the Land of the Peaceful Thunder Dragon. Nestled in the lap of the Himalayas, Bhutan offers spectacular mountain views, immense scenic beauty and a unique culture and lifestyle. You can see beautiful Buddhist monasteries, carved wooden houses and the fine crafts of Bhutan, on tours to Bhutan with tourism in Bhutan. This is the last town on the highway before entering Central Bhutan. Sitting on top of a hill, the formidable Dzong is the town`s most visible feature. In the 17th century Wangdue played a critical role in unifying Western, Central and Southern Bhutan. Arrive Wangdiphodrang by the middle of the day and before getting to the hotel, visit the Wangduephodrang Dzong. The town is no more than an enlarged village with a few well-provided shops. 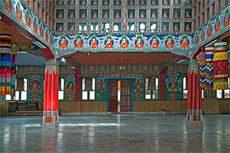 Bumthang, at an altitude 2600 metres has an individuality that charms its visitors and separates it from other regions. 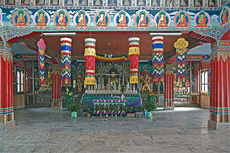 Comprised of four smaller valleys, the deeply spiritual region of Bumthang is shrouded in religious legend. Here tales of Guru Padmasambhava and his re-incarnation known as Tertons still linger in most nooks and corners. At an altitude of 2200 m forms the central hub of the nation and is historically the place from where attempts at unifying the country were launched. The Royal family has strong links with Trongsa. Both His Majesty King Ugyen Wangchuck and his successor, King Jigme Wangchuck ruled the country from this Dzong. Motithang mini zoo to see the rare "Takin" the National animal of Bhutan. "The Beautiful Valley" To the north, Mount Chomolhari ("Mountain of the Goddess"), reigns in white glory. The glacier waters from its "five sister" peaks, plunge torrentially through deep gorges, finally converging to form the Paro Chhu River that nourishes the rice fields and the apple and peach orchards of the Paro Valley. Paro is one of the most fertile valleys in the kingdom, producing a bulk of the famous red rice from its terraced fields, home to some of Bhutan`s oldest temples & monasteries. The largest and most colorful festivals take place at Bhutan`s dzongs and monasteries once a year, especially in honor of Guru Rimpoche. They are normally celebrated in spring and autumn. Tsechus consist of up to five days of spectacular pageantry, masked dances and religious allegorical plays that have remained unchanged for centuries. Besides being a vital living festival and an important medium of Buddhist teaching, tsechus are huge social gatherings. Bhutanese revel and exult together, dressed in their finest clothes and jewelry, in a welcoming ambiance where humor and devotion go hand in hand. For guests, the tsechu provides an ideal opportunity to appreciate the essence of the Bhutanese character. The Drukpas form the major chunk with nearly 67% of the total population. They are of two groups. Those related to the Tibetans speak Dzongka. The other major language is Tsangla in the east with 11 different dialects. The Nepalis form 20% of the total Bhutanese people. Formerly the second largest peoples group after the Tsangla, they inhabited the southern region mostly. However, lately due to disagreements over government policies they have moved back to Nepal, their country of origin. Indians, Tibetans, Sikkimese, Sherpas, etc., form the remaining 13% of the population. The unity of the Bhutanese people and independence of the country is under control of the state religion, Buddhism. 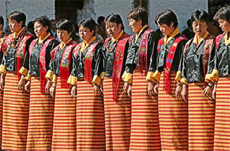 All the citizens of Bhutan, whether Government officials or the common public, wear the national dress at all times in public. The national dress for men are called a Gho, which is long robe tied at the waist and pouched over the belt to form a pocket. Government senior officials wear a sword on ceremonial occasions. Women, who enjoy equal rights with men and play an active part in national affairs, wear an ankle-length robe called Kira, which is tied at the waist with a wide sash and fastened at the shoulders with silver broaches.